In a country where “liberalism” means big government and “neoconservatism” implies utopian derring-do, the mangling of another abstract noun was probably due. What US politics has done to “socialism” over recent months is no less regrettable for that. Donald Trump won the presidency by taking the second approach but has governed, mystifyingly, with the first. Having begun his White House campaign with a pledge to save not just Medicare (which serves the old) but Medicaid (which serves the poor), he has cut taxes and is now seeking welfare efficiencies to make up the budgetary shortfall. After all his vaunted “disruption” of GOP orthodoxy, he seems set to run on a platform of colour-by-numbers Republicanism, at least in domestic affairs. If this is the right’s plan to save the free-market system, then capitalists should take their chances with the left. There is a plausible future in which a more generous welfare state, funded by taxes on those who have been enriched by a decade’s asset inflation, drains some of the anti-capitalist pus from the body politic. There is no plausible future in which another round of unreconstructed supply-side economics does the same. One more presidential term of this stuff would be a tactical gain for free-marketeers, true, but what of the strategic risk? For the short-term pleasure of lower marginal tax rates and thinned-out regulations, they risk the further disillusionment of an electorate that already worries about the fairness of the system. Millennial attitudes to capitalism should keep them up at night. The transient nuisance of a “progressive” administration should not. The priority of capitalists is not the election of Republicans. It is the maintenance of public support for capitalism. If this is best achieved through some redistribution and regulation, it would not be the first time. As ever in politics, the trick is to distinguish between lesser and greater evils. Not everyone can. Consider the sulphurous unpopularity on Wall Street of Elizabeth Warren. Even potential Democratic donors wonder what they will do if the Massachusetts senator becomes the party’s candidate in 2020. Her crime? A taste for wealth taxes and financial regulation. It is natural for bankers to worry about these policies. But they should also worry about the anger that will be stored up if somevariation of her reform does not happen. Ms Warren is “a capitalist to my bones”. She wants more, not less competition in the economy. If capitalists think that four or eight years of her leftish technocracy is the worst that can happen, they are not using their imaginations. Better her than a more severe reckoning with public opinion down the line. Better a controlled explosion than a random, all-engulfing one. Right now, the political debate concerns the excesses of capitalism. In no time at all, it will move on to the fundaments of the system itself. The preservation of capitalism through its moderation: there is no paradox here. Dwight Eisenhower understood it as basic statecraft, as did Richard Nixon and other Republicans who reconciled themselves to big government. Mr Trump reached a similar intuition in 2016. At least as far back as John Maynard Keynes, the truest friends of capitalism have understood that it cannot command an electoral majority in its purest form. Franklin Roosevelt turned out to be a better custodian of the system than those who cried philosophical betrayal at first whiff of the New Deal. He knew that an idea can die of purity. Too few now do. There is more to the defence of free markets than the resistance of all reform as a red menace. If Republicans have become dangerous to the cause, it is because they believe in it too much. This year’s battle between providers of exchange traded funds to drum up new business has made an anaemic start with worldwide investor inflows down more than a quarter in the first three months. The weaker growth from almost all ETF managers comes in spite of a 13 per cent first-quarter rally for the S&P 500, the US equity benchmark, and strong gains across other equity markets globally. Investors ploughed $99.1bn into ETFs (funds and products) in the first three months, down 28 per cent on the $136.8bn registered in last year’s first quarter, according to preliminary data from ETFGI, the London consultancy. Lyxor, the Paris-based asset manager, reported the weakest quarterly performance with outflows of $3.1bn. It followed a disappointing 2018 performance for Lyxor’s ETF business when it gathered just $2.7bn over the whole of last year. Arnaud Llinas, head of Lyxor’s ETF business, said there were “significant outflows” from EuroStoxx 50 ETFs as well as individual country funds tracking stock markets in France, Italy and Spain. Jobs will be cut this year at Lyxor after its parent Société Générale said it would reduce staff numbers by 1,600 as part of a plan to cut costs by €500m. Société Générale declined to disclose how many jobs would be cut at Lyxor. State Street, the third-largest ETF provider globally, also made a weak start with net outflows of $1.8bn while China Asset Management registered $1.9bn in ETF withdrawals. New business for BlackRock’s iShares division, the world’s largest ETF manager, dropped 13 per cent to $29.3bn. Pennsylvania-based Vanguard, the nearest rival to BlackRock, attracted ETF inflows of $19.2bn, a decline of 19.2 per cent. The unexpected shift in monetary policy by the US Federal Reserve, which signalled last month that it would refrain from raising interest rates for the rest of the year, stimulated inflows into ETFs linked to fixed-income markets. Bond ETFs gathered record inflows of $56.4bn in the first quarter, more than double the same period last year and taking assets in fixed-income ETFs closer to the $1tn milestone. Matthew Bartolini, head of Americas research at State Street Global Advisors, said the interest rate shift by the Fed and other central banks should further support risk assets such as equities and high-yield bonds. “Just don’t expect the pace of gains [seen in the first quarter] to continue this late into the cycle,” he said. Bank of America Merrill Lynch said investor optimism appeared to be improving with clients rotating out of single stocks into ETFs for a fourth consecutive week ending April 1. The consensus forecast among Wall Street analysts is for earnings growth for the S&P 500 to slow to 3.5 per cent in 2019 from about 21 per cent last year due to weaker US growth and trade tension between Washington and Beijing. Savita Subramanian, head of US equity and quantitative strategy at BofA, said the outcome of the trade negotiations with China was “the key factor” for US earnings in 2019. She said that a “real trade deal” could boost S&P 500 earnings by about 1 percentage point in 2019. A full-blown trade war involving higher tariffs on $200bn of US exports to China would reduce S&P 500 earnings by a similar amount in 2019. - The S&P 500, and stocks in general, are at a crucial inflection point. 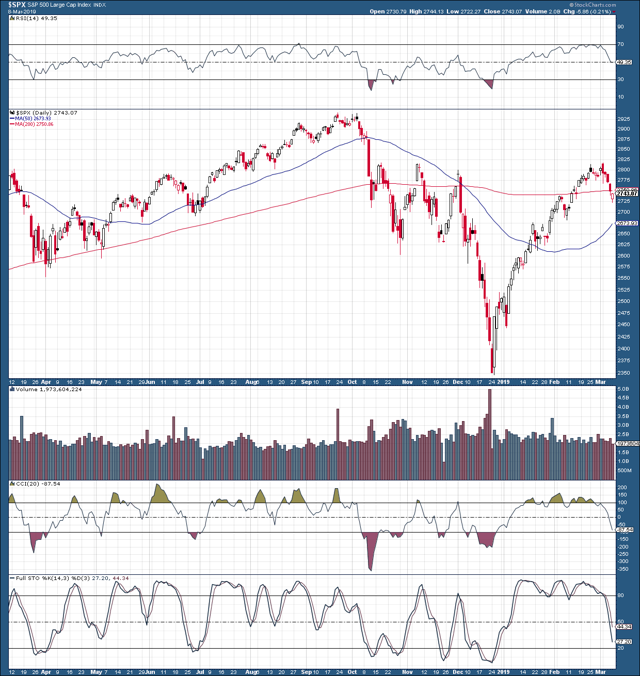 - The S&P 500 needs to break out above the 2,800 soon, or momentum could dissipate, and stocks would be in serious danger of entering a bear market. - Moreover, warning signs are abundant, suggesting the illusive economic recession is now clearly on the horizon. - Don't ignore the danger signs. - Reduce risk exposure, rotate, increase yield, and hedge to stay in the game and decrease downside risk to your portfolio. The S&P 500 is at a crucial inflection point. Stocks could either rebound from their recent slump, or this selloff could intensify, equities could enter a bear market, and stocks could potentially go much lower. I have been short-term bullish since the stock market bottomed in late December, and I've written several articles why stocks are likely to continue their move higher, citing the 2,800 level as the most crucial resistance point likely to stand in the way of new all-time highs. So, here we are, the S&P 500 rallied by 20% from the bottom and is now struggling to break above 2,800. I am not implying that it's time ring the alarm bell, but market participants should be getting more cautious here, especially longer-term. There are a growing number of warning signs that suggest the economy is weakening, and could continue to deteriorate further. Warning signs are abundant, and they should not be ignored. Moreover, the Fed's influence to prop up stock prices may be more limited than many market participants perceive. 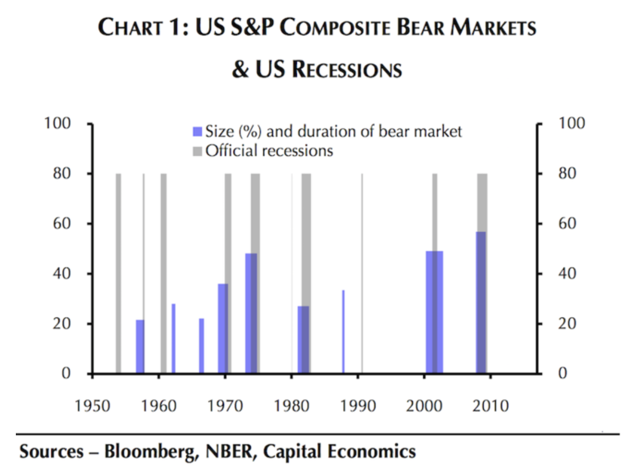 Therefore, a recession is likely approaching, and if the S&P 500 cannot breakout above 2,800 soon, momentum is likely to dissipate, and stocks could potentially enter a bear market that could take equities much lower. The recent nonfarm payrolls report of 20k was very disappointing. However, since the prior month's report was a big beat, this 20k number may be attributed to a hangover effect, and one month does not necessarily constitute a trend. However, future months could tell a story of a worsening labor market if numbers continue to disappoint. 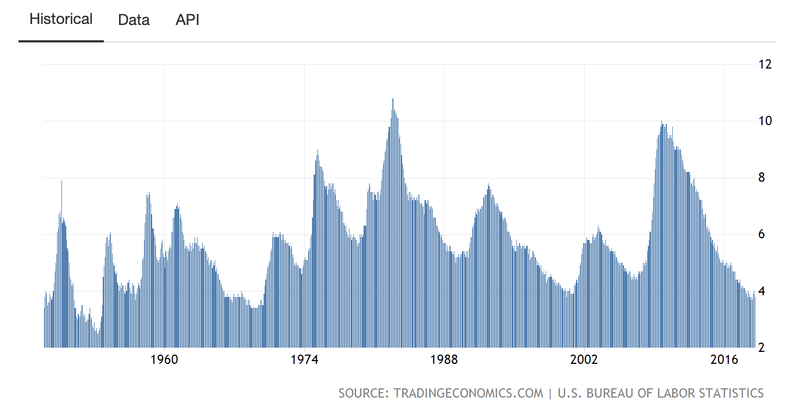 Also, if we look at the current unemployment rate, we see that it has gotten down to an extraordinarily low level, and it is likely going through a bottoming process right now. If we look at a short-term chart, we see that the unemployment rate has been stuck in a range between 3.7% and 4% for a year now. If we look at a long-term chart, we see that such periods of unemployment rate bottoming have preceded recessions and major stock market declines. The unemployment rate has not been this low since about the late 60s, right before a major recession hit. Further, we can see ultra-low and/or bottoming unemployment periods coinciding with recessions in the early 90s, early 2000s, and 2008. Another troubling factor is the sharp drop in inflation. Just look at the CPI rate, which has been cut in half from nearly 3% to just 1.6% in the last 7 months. Inflation faltering sharply such as this is not good for the economy, as it signifies a deceleration in growth, and could potentially lead to stagnant growth or deflation, which is the archenemy of higher asset prices. 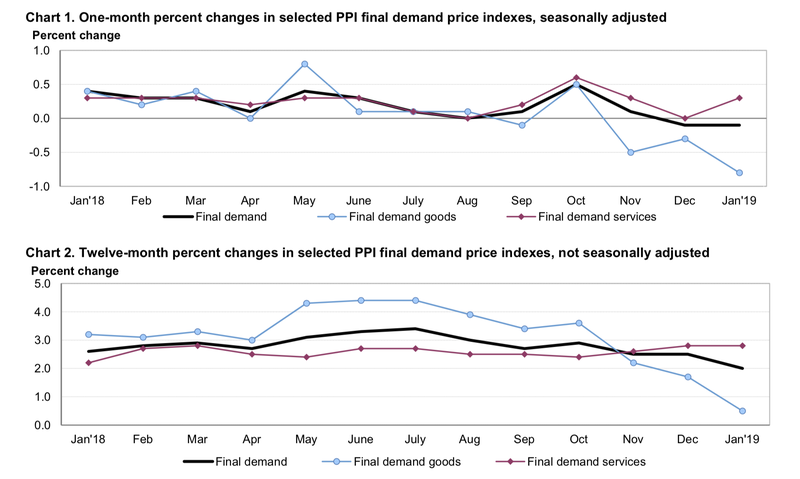 The image is even worse if we look at the PPI, as producer prices have fallen off a cliff since last October. Final demand goods inflation has tanked from over 4% in the summer of last year to just under 1% last reading. 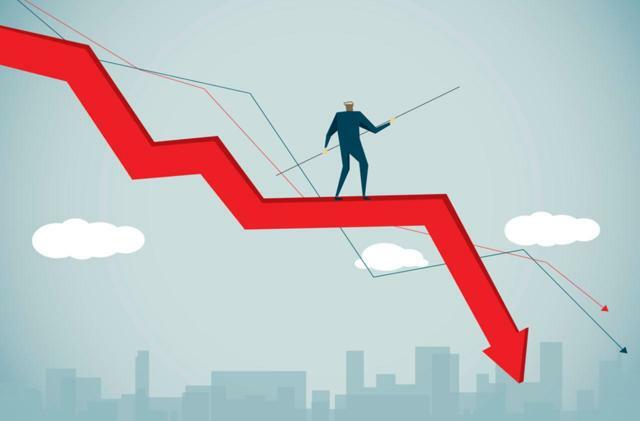 Falling prices may be beneficial to some facets of the economy, but in general, it is a clear warning sign that growth is decelerating, and could continue to drop going forward. The economy just went through its best expansion year since the recovery began in 2009, 3.1% for full year 2018. Now, some of the growth materialized due to tax and fiscal stimuli provided by the Trump administration's initiatives undertaken in recent years. Also, the consumer was still extremely strong in 2018, and corporations had record profits. Will 2019 top 2018 even though corporate earnings may have peaked, tailwinds from government stimuli are fizzling out, inflation is falling, and the consumer seems to be slowing down? I am not so sure. Thus, GDP could stagnate, or decline this year, therefore, putting the U.S. in a recession later this year, or in 2020. There is no denying it, consumer spending has been on a tear in recent years. 2018 was by far the record year, but could spending be reaching a top? After all, with record amounts of debt all around us, it certainly seems possible. Let's look at two key components, consumer confidence and retail sales. Retail sales declined by 1.2% last month, the worst MoM decline since the times of the great recession. Is this just a one month fluke? Maybe, but it could be a warning signal instead. Perhaps more importantly, consumer confidence appears to have topped and appears to be turning now. We also see that consumer confidence typically tops right before a recession hits. We can see tops in consumer confidence coinciding with recessions in the mid 70s, late 80s, 2000, and 2007. We also see that consumer confidence typically tops out around 101, and 101 was reached in early 2018, and now appears to be trending lower. 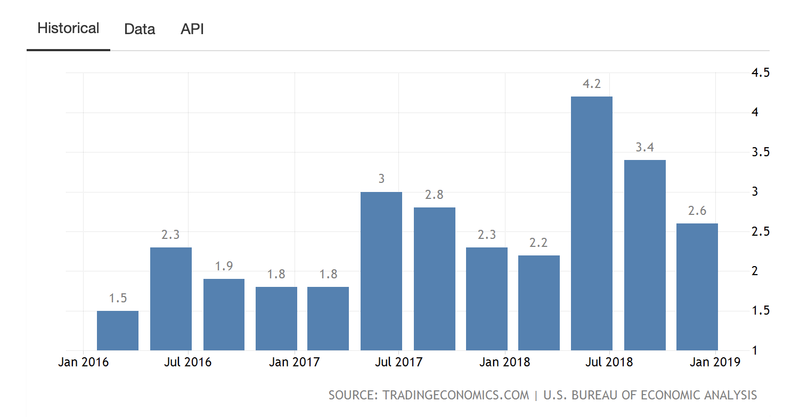 With retail sales slowing, and consumer confidence declining, consumer spending growth is likely to slow, may stagnate, and could even decline going forward, which will reflect negatively on GDP as about 70% of U.S. GDP is generated through U.S. consumer spending. Corporate earnings have surged over the past 10 years, and with the "Trump Tax Cuts", coupled with other government stimuli, have essentially gone parabolic in recent quarters. There is bound to be a hangover effect, and a corporate recession seems very plausible this year. In fact, some analysts are predicting just that, Morgan Stanley's chief equity analyst Mike Wilson says that earnings expectations are likely to come down further, and hopes for an earnings reacceleration in the second half of 2019 is misplaced. Overall, the chief equity strategist expects earnings growth could fall by as much as 3.5% this year, which should put additional pressure on GDP as well as equity prices in general. The 2-year and the 3-month are now providing higher yield than the 5-year. Moreover, the spread between the 5-year and the 10-year is fewer than 20 basis points now. 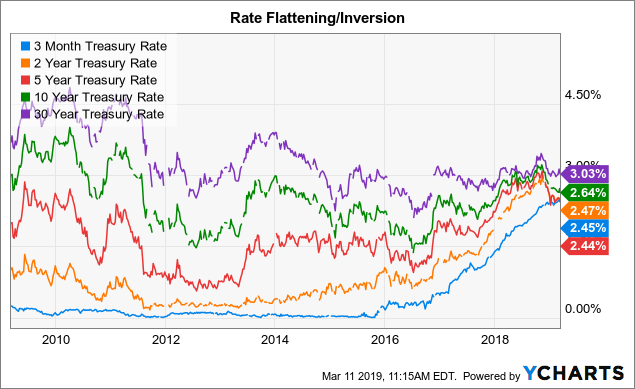 The bond market is telling us that longer-term rates are gaining demand as bond investors want to lock in the rate they can now, before longer-term rates go lower in the future. Why would longer-term rates go lower? Most likely because the Fed will need to bring long-term rates down as another economic downturn or a recession approaches. This way, the bond market is essentially telling us that a significant market downturn may materialize relatively son. Sector rotation continues to be of a very defensive nature. If we look at all the 11 major sectors, the only two making new all-time highs are utilities and real estate, the two most defensive sectors. Other sectors, especially the more economically sensitive ones like energy, technology, and others appear to be struggling with major resistance levels. The bottom line is that there is a lot going on beneath the market's surface. There are a lot of red flags, and there are many concerns, but valuations are far from cheap. Despite a recent blip lower, S&P 500 companies, on average are trading at 2.07 times sales, close to a record high. This suggests that in general, stock prices have expanded to a record level relative to underlying company revenues. Moreover, the S&P 500 P/E ratio is at 21.04, which is about 43% above its historical median average of 14.74. A case could be made for higher valuations when there is plenty of growth runway left in the economy, but at a time such as this, it hardly seems appropriate to pay such premiums for equities. Perhaps most notably, the Shiller PE is at around 30 right now, one of its highest gauges in history, even well above the valuations we saw in the 2007 market top. 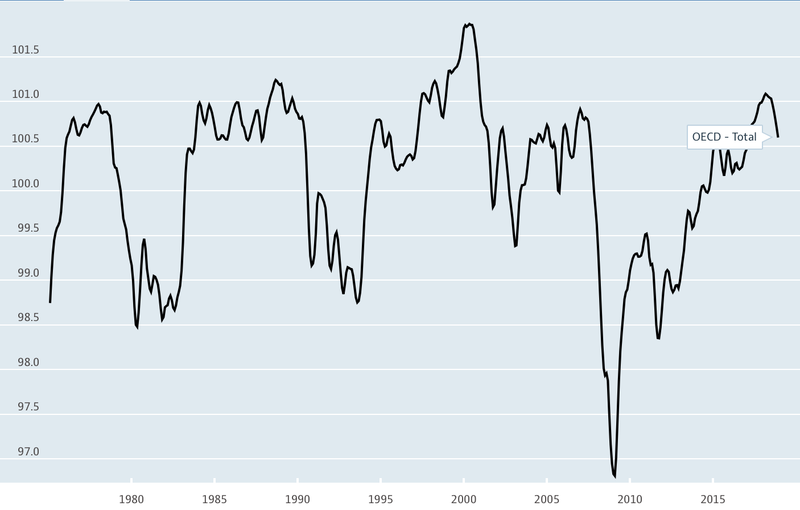 In fact, the Schiller P/E is about 91% above its historic median of 15.7. This implies that the S&P 500 would need to correct by as much as 48% from current levels just to get back down in line with the median norm. A 48% decline would bring the SPX all the way down to the 1,426 level, quite the steep decline from current levels. Again, a case for much higher than historic valuations could be made in certain market conditions. However, this does not appear like an appropriate time, as the U.S. is likely towards the latter part of an economic cycle, and a rescission appears to be materializing on the horizon. The Fed has provided an incredible amount of monetary stimulus over the last decade to prop up and propel stock prices. In fact, the Fed essentially quintupled the monetary base in the 5 years following the financial crisis. However, the Fed cannot continue to blow this monetary bubble forever, as the Fed's balance sheet is already extremely bloated, and rates can only go so low. Furthermore, exacerbation of the Fed's monetary policy can lead to unintended consequences like much higher than intended inflation, which can turn into a systemic risk for the U.S. economy. Ultimately, the Fed is not almighty, and while the organization has done an excellent job at propping up asset prices and extending the current economic expansion, it won't be able to keep the pending recession at bay forever. The market has been largely decoupled from political events for a long time, however, all this may change soon. First, market participants should not ignore the possibility of a possible impeachment of the current sitting President. The Democrats now control the house, and many, or perhaps collectively even, are intent in bringing about the downfall of Donald Trump. The Mueller probe is producing pleas, convictions, former trump allies are flipping, some are giving damaging testimony to Congress, and so on. 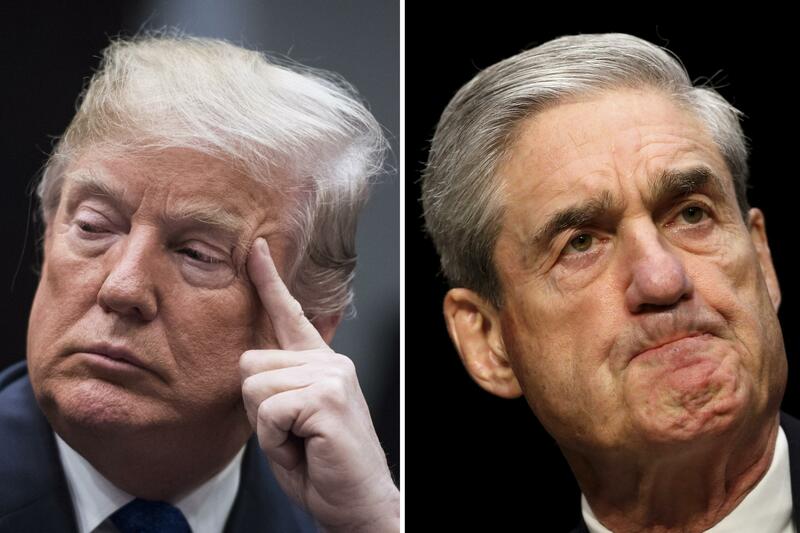 The stage may be getting set for when President Trump is officially implicated in illegal activities, which could serve as a basis for an official impeachment process. This would likely be damaging for the stock market, however, what would be even more damaging, is if a Democratic President got elected in 2020. The Democratic party has become radicalized in many respects. Many democrats are screaming out for higher taxes, stricter regulation, redistribution of wealth, and essentially socialism. Does any of this sound bullish for stocks? No, it is not. In fact, much of what the Democratic party is proposing are antigrowth policies that are likely to expend government, hurt business, blowout the government debt, and tilt the economy closer to a recession. Right now, technicals are extremely important to the market. The market is at a crucial inflection point, and if momentum let's up now, prices could drop a lot lower. The most optimal scenario would be for the S&P 500 to rebounded around the 2,725-2,700 level. This would suggest that the market could potential break above the 2,800, in which case momentum and sentiment would likely drive the S&P 500 back up to prior highs, and then to new all-time highs. On the flip side, if 2,800 fails, and the S&P 500 is not able to hold the crucial 2,625 support level, stocks are likely to at least retest the prior lows of 2,350. 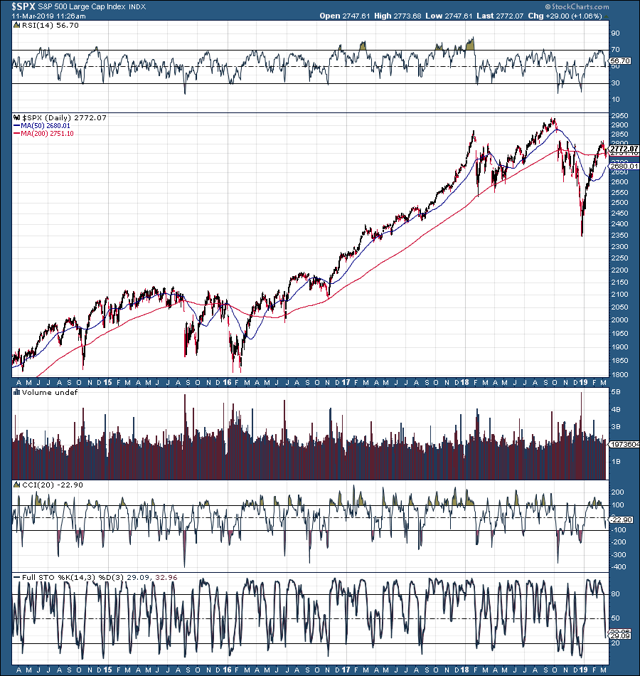 A failure in upside momentum at this point would also greatly increase the chances of the current rout being the early stages of a prolonged bear market, that could potentially take the SPX down to the 1,400 - 1,500, or possibly lower even if stocks overshoot to the downside in a panic like scenario. While I am still short-term bullish on stocks, I remain longer-term bearish on equities as I strongly believe a recession coupled with a violent bear market is imminently approaching. If the S&P 500 can manage to break above the 2,800 level it is likely to retest prior highs, and could potentially go on to make marginal higher all-time highs. Nevertheless, the downturn will materialize regardless, and based on the overwhelming amount of economic evidence a recession is possible, likely even, this year or the next. Therefore, regardless where the next top is 2,800, 3,000, or 3,200, a significant market decline seems overwhelmingly likely relatively son. Diversity is also suffering at the Pentagon with the recent departures. Before they announced their resignations, Wilson and Bayer were two of just six Senate-confirmed women serving in top Pentagon positions, according to Loren DeJonge Schulman, a former Pentagon official who researches national security and defense reform at the Center for a New American Security. With their departure, this number will dip by one-third. In addition, just one of six undersecretaries of defense is female. Robbie Gramer is a diplomacy and national security reporter at Foreign Policy.